Although I was really looking forward to our first talk of the year, I was also apprehensive about the number of things which could potentially go wrong when acting as host to Christopher Le Brun. We were holding the event at Swindon Dance because of the exhibition change over in the art gallery which meant we couldn't hold it there. Luckily Swindon Dance were able to let us use their studio because it was half term, but it meant we had 98 seats to fill; I emailed the Friends, advertised on social media and encouraged as many people as I could to come along. It was alright on the night, Christopher's train arrived on time, he was dropped off at Swindon Dance at 6.35pm, giving us chance to have a chat to him beforehand. 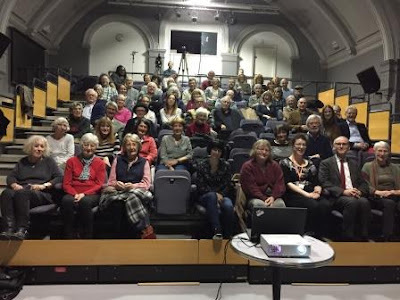 Lots of people did come along, I took a photo at the end of the evening, quite a good crowd, maybe 70? We were asked to produce a transcript of the evening, and decided to ask Create Studios, at very short notice, if they could film the event. We were very lucky to have Henry Meredith coming to film the evening, here he is in the photograph below, setting up and checking everything. The video will appear online as soon as we have it, and was a timely reminder that we need to video all our talks and make them available on the website. 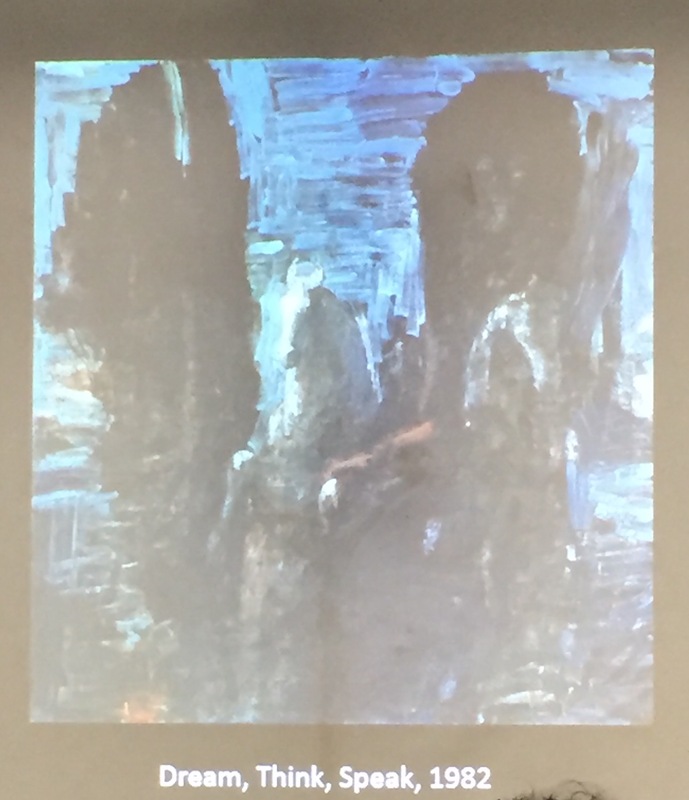 Although Christopher Le Brun was 'in conversation' with our Curator, Sophie Cummings, it was agreed that he would talk for 20 minutes, then have a conversation with Sophie and then take questions. At the Slade where his tutor was John Hoyland, and figurative art wasn't favoured at that time, Le Brun went home to work on paintings he was discouraged from working on at college. 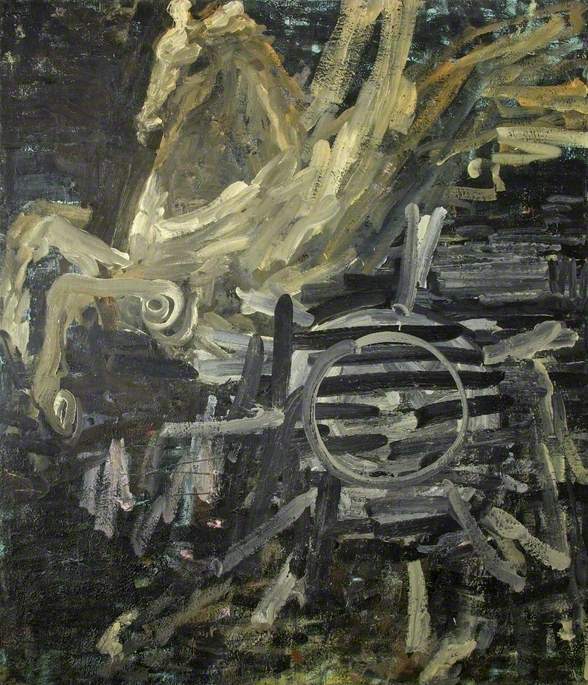 During 1982 when he had finished the magnificent 'Hyperion', seen below, it was in the Nigel Greenwood Gallery when Richard Morphet encouraged Swindon Museum and Art Gallery to acquire with the help of the V&A fund. Le Brun talked quite a bit about this painting, which coincidentally hung over the stairs in the Town Hall when it was first acquired by Swindon Museum and Art Gallery; the great hooks it hung from are still in the wall! You will be able to find out exactly what Le Brun said when we have the video on the website, but what did I take away from the evening? I thought he was an inspirational speaker with a tremendous understanding of his life and was able to give us a fascinating insight into some of his personal highlights He has remained true to himself, and feels it's best to produce work from the heart because it shines through, and that's what people want when buying a painting. 'Dream, Think, Speak' was painted in the same year as 'Hyperion'. and the 'Three Riders' a bit later. Please let me know if you'd like a copy of the book, we can order them together. 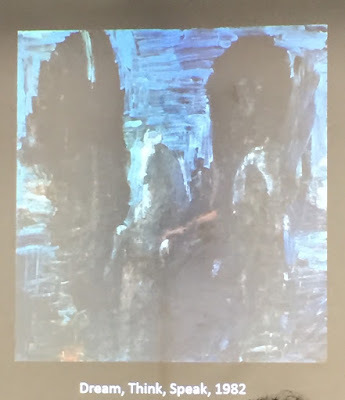 Yes it's true, Christopher Le Brun, is coming to Swindon for one of our 'in conversation' evenings, to be held at Swindon Dance in the Town Hall, SN1 1QF, with Curator Sophie Cummings. We have 98 tickets to sell for the event, and I'm now advertising this fact so that as many people hear about it as possible, and don't miss out. 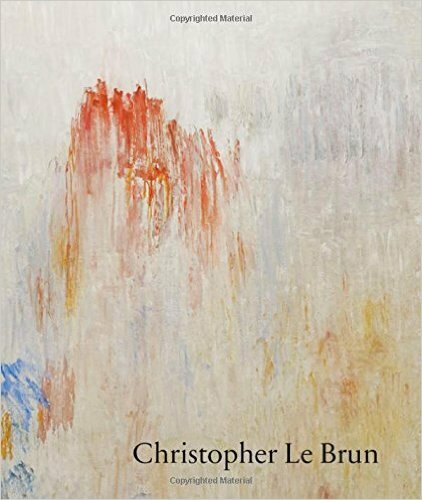 Looking up Christopher Le Brun's influence is easy, he's been involved in so many things. In recent years he has been a trustee of the Dulwich Picture Gallery and the Royal (formerly Prince’s) Drawing School, which he helped to establish in 2000. In the same year he was elected Professor of Drawing at the Royal Academy. He was elected President of the Royal Academy in December 2011. He is the 26th President since Sir Joshua Reynolds and the youngest to be elected since Lord Leighton in 1878. 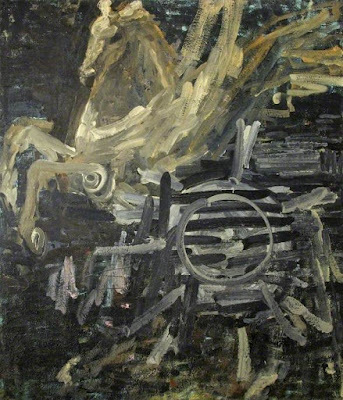 Citing Romanticism and Symbolism among his inspirations, as well as musical compositions, literature, and his own materials, Christopher Le Brun produces expressive paintings, prints, and sculptures that range from abstract to representational. Working from intuition and with intention, he reveals his process and his hand in everything he makes. “At least half, if not more, of the driver of my work is the engagement with materials,” he has said. For his sculptures, he works in bronze and relies on motifs that include horses, wings, and semi-abstract forms suggesting human figures. He paints in oils and watercolor, building up his compositions with visible layers and brushstrokes. Rather than honing a particular style, Le Brun prefers to challenge himself with new projects and approaches. The talk starts at 7.30pm and tickets are £6 for Friends and £8 if you're not yet a Friend, although you can join on the night.